Our family has our Advent wreath and calendar, Jesse tree ornaments, and books and readings set up and ready to go! It’s something that our kids, even the very youngest, look forward to all year long. It’s amazing to me how even the toddlers recognize and remember the candles, calendar, and ornaments! This past week, Karate Kid (11) came home from youth group bemused. The lesson had been on Advent, and he told me with surprise that none of the other kids in his group had seemed to know what it was at all! It had never occurred to him that not everyone observes Advent and the seasons of the church year. I explained to him that many just aren’t aware of what it is and why it’s done. I wasn’t. The church I was brought up in didn’t recognize the traditional church year beyond Christmas and Easter. It wasn’t until I was a young mom with a toddler trying to establish my own family traditions that I began to learn about the liturgical year and how it can enrich our faith and be a wonderful teaching tool. Advent is, of course, the season of preparation that comes before Christmas. The word comes from the Latin word for “coming” or “visit”. It begins on the fourth Sunday before Christmas and ends on Christmas Eve. During Advent, we prepare to celebrate Christ’s birth by remembering the years of longing for a Messiah, and we also look forward to his second coming! I started out years ago cobbling together my own Advent wreath with candle holders and greenery from the craft store and using readings I found online. No one at any of the stores I went to had any idea what I was talking about when I asked if they carried Advent wreaths! Thankfully, over the years it seems like it’s become much easier to find them, and there are many options available online now. In addition to the traditional wreath, we have a cloth calendar that counts the days beginning on December 1. 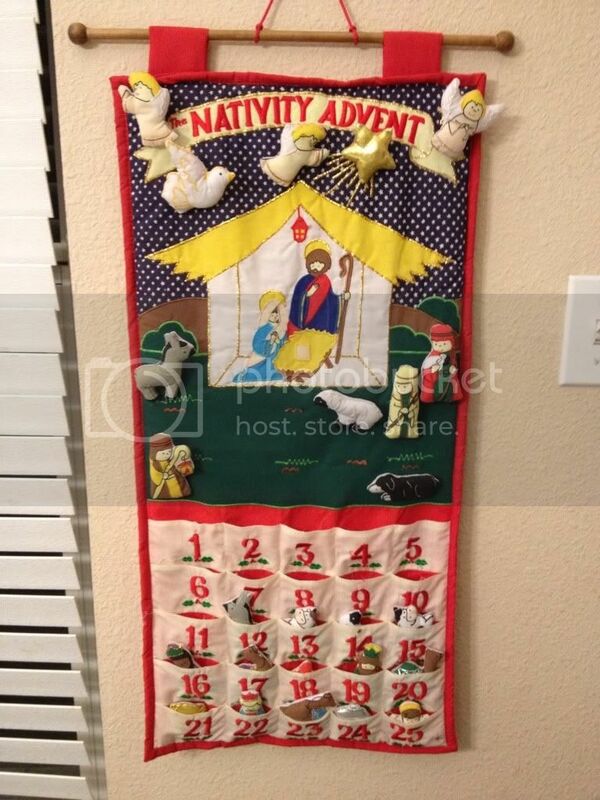 The kids love taking turns adding the next piece of the Nativity scene each day, and it’s an especially big deal when it’s your year to be the one to place the baby Jesus in his manger on Christmas Day! For years we also did a Jesse Tree that I made out of felt. It finally gave out several years ago, so we’ve graduated to using a small live tree and ornaments we’ve printed out and mounted on cardstock from one of the several versions available online. A Jesse Tree is similar to the Advent calendar, but focuses on telling the story of redemption beginning in Genesis and tracing Jesus’ lineage. Ornaments representing different stories and people in Jesus’ family tree are hung each day. I love this concept because it really helps children (and adults!) connect all these events and see the one thread that holds them all together, instead of seeing them as isolated stories with a moral or lesson. 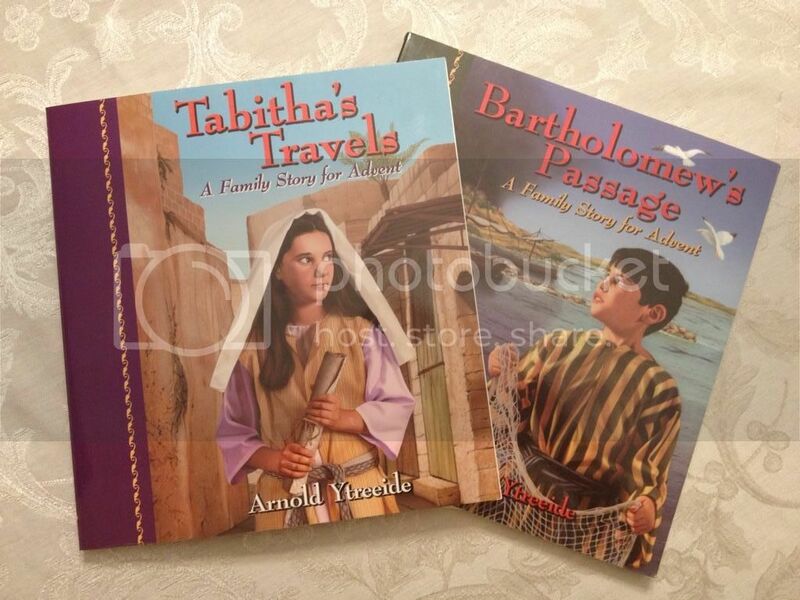 We’ve also loved reading through Jotham’s Journey and it’s two sequels, Tabitha’s Travels and Bartholomew’s Passage. These books each tell the fictional adventures of a child who is somehow related to Christ’s birth. They’re broken up into readings for each night during Advent, with a special devotional section to read each Sunday evening after the story. We rotate through the books, reading one each year, and the kids never tire of hearing them again! Our copy of Jotham is on loan to another family right now, so we’ll read Tabitha this year. In addition to these Advent activities, we celebrate Saint Nicholas Day. As young parents, we struggled with how to handle the Santa tradition. Celebrating the real Saint Nick’s feast day and learning about his life has been a great way to learn about the true story behind the legend and focus on the spirit of generosity and giving he exemplified. Hanukkah also generally falls during this time period. I’ve written before about the value of learning about and celebrating the Biblical feast days. And then of course, after Christmas Day comes the twelve days of Christmas and Epiphany! But we’ll talk more about those another day. Of course, none of these observances or traditions are required. But I do think they’re an incredibly rich resource for immersing our families in and focusing on what God has done and is doing all year long! I know that they are a treasured part of our family’s traditions, something that every one of us eagerly anticipate doing together. Lest you’re overwhelmed by all of this, let me assure you that we don’t do it all every year! With a husband who works retail and other holiday activities we’re involved in, our schedule just doesn’t allow for fitting everything in. Sometimes we have to double up days on our story reading (especially during Nutcracker week!). We often have to reschedule Saint Nicholas Day by a few days, working around our community’s Nutcracker performance and Dad’s schedule. Depending on when Hanukkah falls, we sometimes do the same with it…and sometimes it’s a one day celebration rather than observing all eight days. There have even been years when Hanukkah has been skipped altogether! The point is not to be legalistic about it or stress your family out trying to do it all, but to make it work for your family! I think many families are like I was…simply uninformed and unaware. I’m so thankful that now there is such a wealth of resources, both online and in print, that make wonderful tools to help us take advantage of the wonderful opportunity these seasons offer us to enrich our family’s faith. The Festival of Lights: Why Celebrate Hanukkah? I hope you’ll join our family as we prepare our hearts for Christmas over the next few weeks. Wishing you an Advent season filled with joy! 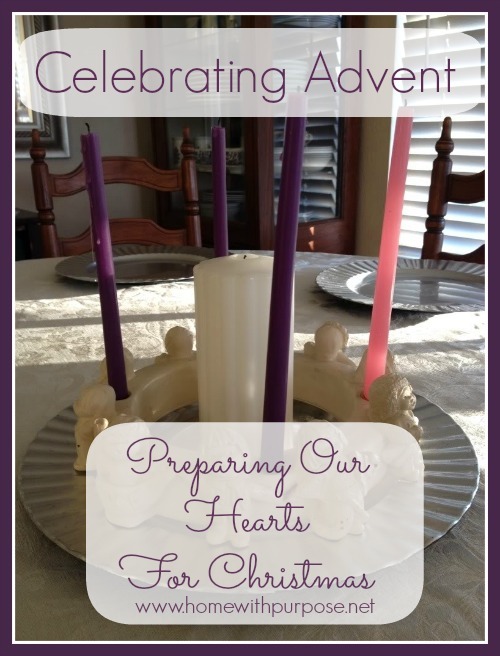 How does your family celebrate Advent? Kara,I was totally thrilled to read this post. We do a lot of the same things. A few years back, I also decided to throw together my own Advent wreath. Then I purchased a different set up, but still advent candles. We also have the very same soft calendar that you do. The kids love taking turns putting up their character. We have a reuseable calendar with doors that I put a small treat in – usually a kiss or small piece of candy. This is our first year doing the Jesse tree. I downloaded the Voskamp file last year. I have heard of the books your read, but have never gotten around to buying them. I should look into them. It is funny how people can do the same things. Oh, forgot to mention. We also do the St. Nicholas Day. Who knew? We decided last year we would do our stockings on St. Nicks day rather than Christmas. Isn't that where the idea of stocking's came from? :)I think I might just make a post on my blog about our traditions. Thanks for your post. Indeed! I am interested to know if you read any specific devotion with your advent wreath. We have used We Light The Candles, but the kids get bored with it after a while. Phoebe was also shocked that only 3 families in our youth group seem to celebrate advent. We're reading Bartholomew's Passage this year. We read each night. Normally we adjust so that everyone can read together but with one child in college and another one working 5-10 most evenings they are going to missout on some. The cool thing is that they both are bummed about it. So I know they've enjoyed the tradition. We also have a little advent house that you can open doors each day. I put scriptures in each cubbie to read each morning. I agree that whatever we do we need to do it because we want to enrich our relationship with Christ. Not because we feel like we somehow this will make Christ love us more. Our family is celebrating Advent for the first time this year. I grew up in a Christian home, but Advent was not part of our tradition. I struggled to find an advent wreath. In the end, I bought a pack of Advent tapers and a white pillar candle and used a variety of candlesticks I already owned. I arranged these with a crystal Christmas angel to make a centerpiece for my dining room table. We light the advent candle each night, and then I read from Jotham's journey. I'm so glad a friend suggested that book! My kids are 12, 10, 9 and 8, and they are loving it. so pumped to learn about the jesse tree; i've never heard of it before. we're gonna get a late start but i'm too excited to let that little detail bother me. 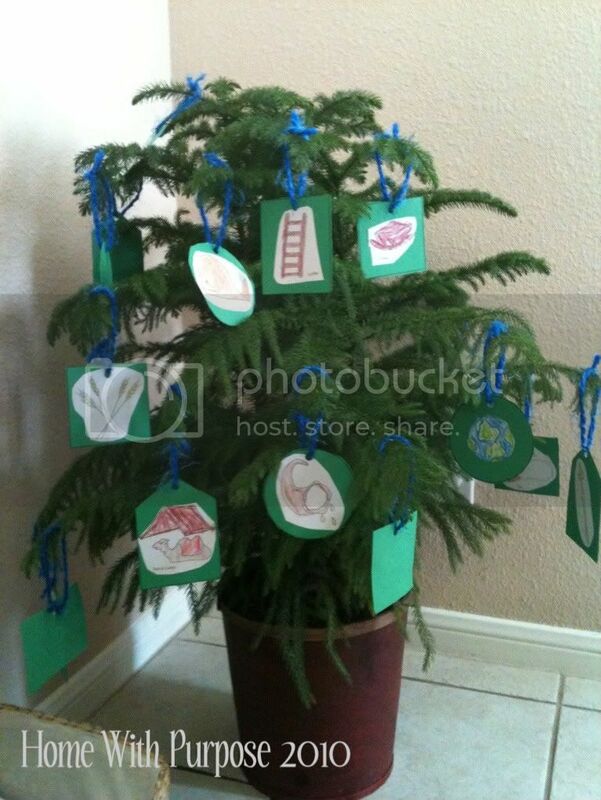 i downloaded ann voskamp's jesse tree devotional and wow is it big! fyi, make sure you have enough paper/ink if you want to print it out. it looks fantastic, can't wait to start, thanks so much.